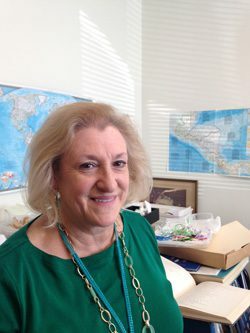 Tina Petway, a native Houstonian became the Associate Curator of Malacology at the Houston Museum of Natural Science in 2005. The HMNS Malacology collection has grown over the past few years and is now the largest of the Museum’s Collections. HMNS is the home of the extensive and irreplaceable collection known as the Northwest Gulf of Mexico Survey of Marine Mollusks. This, as well as many other holding of specimens, are being used by various researchers to further our understand of the importance of these animals and their relevance to the environment. Tina’s mission is to help others understand the value of preserving and protecting the habitats in which these animals live; weather they are Octopus, Squids, Bivalves or Gastropods. They are not just pretty to look at, but the animals that construct the shells and those which have no shell are important to our existence. Not only are they a source of food for most of the world, but what we are learning from them could hold cures for illnesses, pain relief without addiction and many others.